THIS CHURCH built at the same time as the palace of the popes served as a refuge for Benoit XIII who was the last pope of Avignon. It was desecrated during the French Revolution in 1970 to become a Cultural Centre (Institute for American Universities). Bought in 2013 by individuals 2 years of work is transformed into a beautiful house in the historical center of Avignon. A true secret staircase keeps him with period charm. The pieces are based on two main floors and 4 levels, around a large staircase that ends with a spectacular loft of 7 m in height under the roof, restored in the 17th century. beautiful loft with 120m2 of living area, baby grand piano tuned, library, sound system, air conditioning. - A Master bedroom in the old apse of the church (half sphere stone) with a double bed 180x200, wardrobe, chairs, air conditioning, satellite TV. - 1 bathroom with tub, stone shower, exercise bike, separate toilet. - 1 small room 12 m2 with a double bed 140x200, air conditioning, desk, chair, coat rack. Mezzanine loft, a large kitchen with a beautiful church window, rosette old: Kitchen piano 90cm 5 gas burners, electric oven, dishwasher 9 cutlery, refrigerator with freezer, dining room with 2 tables 180x90 , 6 chairs, sofa bed 80x190, dishes for 10 people. This is an amazing space, updated into a modern Provençal wonder, steeped in a rich history. The wonderful and inviting qualities of the space, just a few minutes walk from all of the places to see and be in Avignon, are only surpassed by the qualities of its host. Marianne was a wonderful and receptive host for our group. 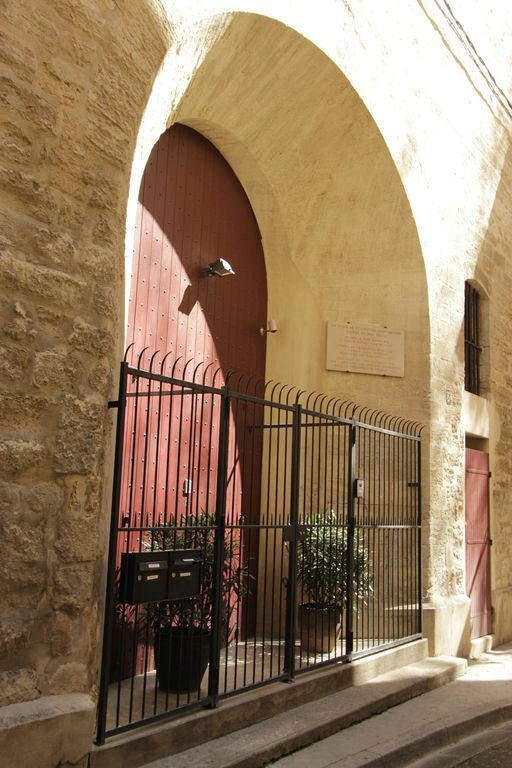 We know Avignon extraordinarily well and believe us when we say that there is likely no other place like this converted chapel to enjoy your stay in Avignon. Moreover, Marianne is a responsive, considerate host and you will not be disappointed. We had a pretty good idea this was going to be an amazing property, but even so, it exceeded our expectations. Marianne took her time as she showed us around to share with us the history of the chapel from the 1300s to its current use. It's a special space. Highlights for us include the the well stocked and expansive kitchen which allowed our family of four to work together easily in meal prep, the excellent craftsmanship of the conversion to a living space, and the sound system which filled the huge living room with music when we were reading after dinner. It allowed for a peaceful retreat after exploring sights in Avignon and the surrounding country. You could host 80 people in that space without feeling crowded, and for a family it was easy to tuck away in a quiet nook during down time. I had a small concern before we arrived that such an old building might be hard to maintain a comfortable temperature in the winter. No issue - very effective Air conditioning and heating for the entire space with ability to adjust temperature easily for the different rooms. If our plans bring us back to the area, we wouldn't even look at other properties. We'd plan our travel for when this is available. Nothing could compare. Thank you Marc for this magical recommandation. I have only wonderful things to say about this property and our stay there. It is beautiful, unique, spacious, clean, comfortable, and well-located. It is on a quiet street only a short walk from the TI (in addition to being useful for information, several tours use it for a meeting point for departure), and still within easy walking distance to the train station if you want to take a day trip from Avignon. Marianne was delightful, and my family loved staying there. It's not often that you get to stay in a place like this! Thank you Susan, it was a pleasure ! Simply wonderful. Pictures don't do the chapel justice. It's a short walk to the market, and there's a well stocked kitchen to prepare your finds. It's a lot of stairs, but worth every step to stay in this piece of Avignon history. Marianne is a lovely host and the attention to details in her beautiful home and to every need we had was noticed and greatly appreciated. Thank you Olivia, good to know you enjoyed your stay. I would be happy to welcome you again, this time with your family. This is truly a standout place to stay in the beautiful town of Avignon. Centrally located, beautifully restored, tastefully decorated and older than the Palais Du Pape itself. Marianne was a wonderful host. Definitely would stay again if ever in Avignon. Thank you Tony for this great recommandation and the “easy check-in” we had for your late arrival.